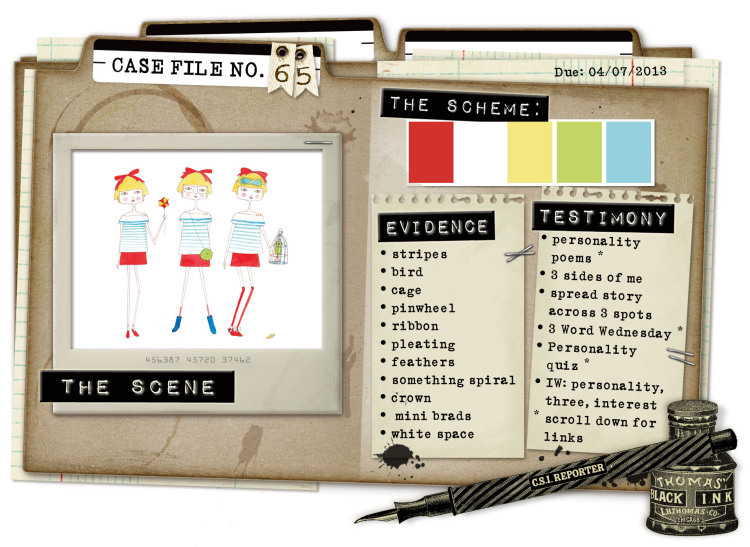 CSI stands for "Color, Stories, Inspiration" and telling your story is probably the most important part. This month's Case Files have had me doing some serious soul-searching and scrapping about myself (which is not something I do very often). You can also download the CSI Coordinates to help you - these are fabulous printable elements, journaling spots and patterned papers which are designer by the talented Michele Singh - and they're all archived so that CSI members can access them FREE at any time! The Scheme: I used all the colours and added black (you're allowed neutrals and 10% accent colour). The Evidence: stripes; spiral of bakers twine; mini brads; white space. The Testimony: 3 sides of me; journal across 3 spots; IW personality, three, interest. If you haven't already look at CSI - check it out now and prepare to be inspired!